Highway 155 is now open from Nespelem to Omak. The road has been closed for days due to the 147,000-acre North Star Fire and the Tunk Block Fire, which together have burned 280,000 acres. The highway was opened early Monday morning, although an earlier information release erroneously stated otherwise, officials stated. The North Star Fire experienced low to moderate growth yesterday. Helicopters dropped water near Nespelem to support ground crews strengthening fire lines there. And an anchor point - a safe place from which to stage people and equipment - is now established on the southeast edge of the fire near Owhi Flats. Red flag conditions will still exist today, until about 9 p.m. Scouting will continue from the air on the western side that faces the Tunk Block Fire, which officials fear will likely merge with North Star. And firefighters continue structure protection for residences in Republic and Aeneas Valley. The fire is 3 percent contained, and still threatens some 2,000 structures. To the west, the Tunk Block Fire grew by 5,364 acres for a total of about 133,000, about half of that on the Colville Indian Reservation. On its east flank, crews today are reinforcing lines near Omak Lookout Road. If visibility allows, they'll get help from the air with scoopers dropping 800-1200 gallons at at time. But smoke from North Star that blows south has been coming back around and headed into the canyon, lowering visibility. Crews are also laying sprinklers and hoses around the Tunk Valley neighborhood. The fire is considered 15 percent contained. Highway 21 from the Colville Indian Reservation boundary north to McMann Creek. Stage 3 evacuations are still in effect for residents in Moses Mountain Community, Haden Creek, including Owhi Flats, Disautel, along Highway 155, all of Aeneas Valley and West Fork. The entire Tunk Block is under a Level 3 evacuation status, meaning no one should remain in the area. 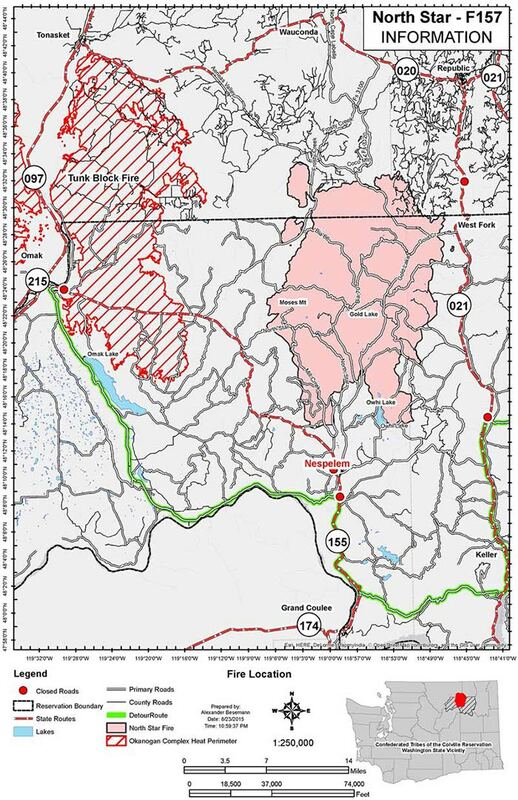 Okanogan - Wenatchee National Forests closure east of Tonasket and south of highway 20. Highway 21 from Bridge Creek Road north to the Reservation boundary is closed; Highway 155 is closed from Nespelem west to Omak. Colville Indian Reservation forest and recreational areas are closed to the public due to extreme fire danger.